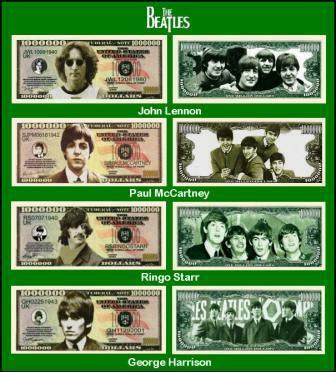 This set of collectible million dollar bills includes John Lennon, Paul McCartney, Ringo Starr and George Harrison. Whether you love the men and or their music this is sure to be a treasured keepsake set of 4 bills. Each bill is professionally printed, is realistic on two sides and is the actual size and feel of real currency. They are finely detailed and colorful on both front and back with high quality printing. This makes a great gift, collectible or frame and display. Each bill will come in its own rigid top loading plastic currency holder for safekeeping.